The object of so much desire. You hear something once, you dismiss it. You hear it twice, you think, eh. But when you hear it five or six different places from people who are in no way connected to each other, you start to wonder. So, when we heard lots of folks repeating the rumor that Wegmans and Price Chopper had a sort of "gentlemen's agreement" to stay out of each others backyards, it definitely caught our interest. 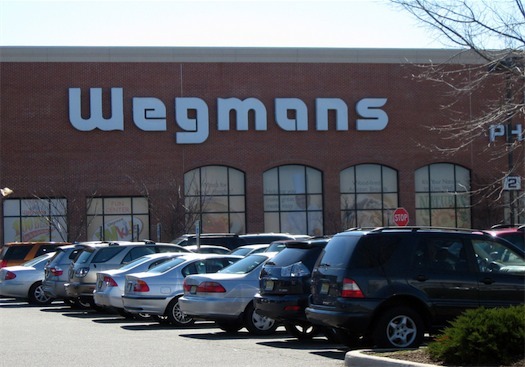 And then we heard rumors that Wegmans might be making it's move on the Capital Region. So, is there any truth to either of these rumors? The short answer for both is: no. According to Wegmans spokesperson Jo Natale, the Rochester-based chain has no plans to build a store anywhere near A-Town. And it's not for the reasons you think. AOA called the corporate offices of both Wegmans and Price Chopper. Both said they, too, have heard rumors about a secret agreement for years. Both also flatly denied it, pointing out that they do compete in markets like Western New York and Pennsylvania. Natale, the Wegmans spokesperson, says the company gets thousands of requests a year to build stores in areas that don't have them. "Don't take it personally" she says, the company is just moving in a different direction. And right now that direction is Pennsylvania, Virginia and DC. According to spokespeople from both companies, there is no agreement to keep Wegmans out of Albany. Thank you for looking into this. I respectfully suggest, however, that this matter needs to be investigated more thoroughly than merely calling each store's corporate office. Naturally they are going to deny it. Until a far-reaching and thorough investigation is done, I remain skeptical with regard to the conclusions you draw. Do you have any suggestions about how to get this information out of either company? Without waterboarding Danny Wegman, that is. In the town of Clay, there are a Wegmans and a Price Chopper in the same general strip mall wasteland. They aren't afraid of competition; both parking lots are always full. The strange effect that grocery competition has in Syracuse is that milk is about a dollar cheaper per gallon than it is here in Albany. Or it was the last time I checked, at least. There are a lot of similar loss leader deals to be found. It's nice. I agree with Bruce, they are NEVER going to admit anything about this to people. My source for the so called rumor is a relative that worked for Wegmans and was told that this agreement existed between the original owner of Wegmans (who recently passed away) and the owner of Price Chopper. They told him they would also flat out deny this. Of course everyone wondered what would happen to said deal once the father passed away. Speculation was that the son would invade PC territory, but truth be told we are not a hot market like there is down south. I'm pretty sure the waterboarding of Culinary magnets was specifically banned by the Godiva Convention. In any case, if there is a story to be told, some of your information will have to come from outside the corporations. Barring an exposee video on Youtube, I don't know how you would get it (if there is information to be gotten). In the meantime, I prefer to consider your findings inconclusive right now. As for BL's suggestion that our area is not attractive for expansion, I disagree. We have a tremendous amount going for us here in the Capital DIstrict. One of the reasons why I like Trader Joe's so much is, with it's bright lighting, wide aisles, ahead-of-the-curve product lines, it's an optimistic company; and similarly, we have every reason to be an optimistic community! I pine for Wegman's. Growing up in northern NY I was only able to shop at Price Chopper, but when I lived in Maryland and the new Weggie's went in just down the road, my heart did a pitter-patter. I was able to enjoy New York state goodness in MD. Even when I visit friends in PA, I make sure to swing by their Wegman's and grab some of the tasty treats I can't find anywhere else. Please get to the bottom of this. We NEED a Wegman's or a Whole Foods.. something besides Price Chopper and Hannaford. Both would thrive in the Capital District. Krispy Kreme pulling out was more of a regional thing, not due to low sales at that store in particlar. Krispy Kreme's demise is due to stock holders greed when they did their initial IPO for the stock exchange. I think they are still under Federal Investigation. Tons of donut fans lost a lot of money due to the stock price dropping like an overstuffed Boston Cream when corporate dumped their overpriced shares. I'd have to agree that this will never be admitted to by either of the two privately held corporations. And yes, there is a very slight overlap of the two markets in the I-81 corridor, but it ends there. To even compare the two markets is like comparing apples and oranges. Case in point, I got a better meal at the Wegman's in Johnson City than at the mall across the street. I wouldn't exactly expect that sort of quality of dining at any Price Chopper. Hey guys, the Honest Weight Food Co-op is expanding! And it's going to be way better than Whole Foods, as well as cheaper. Where else can you get sheep cheese, local hydroponic tomatoes, great bulk selection, and a nose-full of patchouli all in one place? C'mon guys! I don't get the Trader Joe's phenomena. I keep trying to and I keep failing. If you like Trader Joe's, and don't support Honest Weight, shame on you. For me, Price Chopper is utilitarian at best. I feel it is mediocre and go there only out of necessity. When I do shop there, I now look more carefully at stuff like yogurt and meats. In the past, I came close to purchasing stuff that was out-of-date before I realized it. Dirty and dated, it is the Winn Dixie of the North. Hannaford is better, but nothing beats a nice Wegman's. I find it hilarious that anyone thinks Trader Joe's or Wegman's could open a store in the area and that store would not look like the Price Choppers and Hannafords in the same area after a year. Go ahead, drop a Wegman's into center square and watch it turn into the Delaware Chopper. Drop one on Central and it'll look like the Central Ave. Hannaford. Where will they go, to Yuppieville (aka Latham)? have you seen the Hannaford in Latham Farms? It's nice. Also, AOA, there's some messed up HTML somewhere in here. Editors: Thanks for the heads-up. I think the broken tag is fixed now. I've never even heard of Wegman's before this article! Seriously; what's so great about it? I definitely prefer Hannaford to PC. As for Trader Joe's, I have to admit they're pretty cool. I will continue to support the co-op, though I'm not crazy about the new location they chose. It may reduce my number of visits- not out of spite, but due to inaccessibility. If I can't walk or bike to a place, I am far less likely to go. I live near Rochester now, grew up and lived around Albany for 25 years. I will say that Wegmans is a great supermarket. Over here we have Wegmans and Tops. Tops being nowhere near competition for Wegmans in general comparison. Price Chopper is by far the most closely related competition that Wegmans can have. Price Chopper and Wegmans have similar setups as far as the stores go. High focus on prepared foods, deli, bakery and near restaurant like atmosphere. Hannaford can't really compete to Wegmans. However I will say that I also miss Hannaford. If anything, I think Western NY needs Price Chopper and the Capital Region certainly needs Wegmans. I'd also add, WNY needs Stewart's. How I miss Stewart's. Anyone *remember* Grand Union's implosion? The furthest one from home was the Wegman's. That's where mom shopped. Milk and essentials came from the P&C at the bottom of the hill until they closed, then it was Price Chopper 1/2 mile further down the road. Chopper is utilitarian at best, opportunistic at worst. The difference from a 'ghetto' Chopper (Delaware Ave, W'vliet, and the one formerly in Troy Plaza all come to mind) the median Chopper and the 'premium' Chopper (Latham) has always kinda disturbed me. I have a Trader Joe's close to work, had one down the street from the house in California. Eh. Full of prepackaged, overpriced, yuppie meals doesn't appeal to me. Give me a good local grocery store with a good meat department any day. Which is actually where we buy our meat now, the local bodega had a real butcher who knows what he is doing. Want Wegmans in the Capital District? Let grocery stores sell wine and liquor. That's why they picked Pennsylvania for their expansion. Maybe the problem is Albany and the surrounding areas are not yuppy ENOUGH! I grew up in central New York and have family in Buffalo. I went to school at SUNY Albany and now I live here. In central and western New York Price Chopper and Wegman's are side by side and the parking lots are always full. We also have about 4 other options of smaller stores that are locally owned and able to stay open! WHAT'S THE PROBLEM CAPITOL REGION. HELLO. Sure, there are Wegmans & Price Chopper stores co-located in some areas. But just look at a map of Wegmans stores in New York State and then a map of Price Chopper Stores in New York. What do you see? There are no stores within their competitor's "home turf." Coincidence? No way. I'm originally from Central New York and Wegmans clearly has figured it out. Their stores are attractive and fun places to shop. They have great variety. As far as prices, you really have to compare to make sure you're not getting taken advantage of. Unfortunately, after living in the Capital District for almost 20 years, our problem is that people here are too parochial and complacent to make anything innovative happen. They seem to support establishments that are new (remember the Krispy Kreme nuttiness?) but then lose interest. I'd love for us to have more variety here (e.g. Trader Joes), but I think these companies know that we just don't have the sustainability here to ensure that they are going to see enough profit from their investment.